With only the richest of piquant flavors, this Slow Cooker Thick & Chunky Beef Stew will make you feel like the queen at a medieval feast. Slow cooking is the only way to craft a proper stew with hearty and healthy ingredients. Once steeped in their natural juices, these meats and veggies will leave your household beyond stuffed and satisfied. How to attain the riches you seek? Pat down your beef cubes, rub them with salt and pepper, roll them in flour, and arrange them in a pot and brown. Add meat to the slow cooker, pour in the wine, peppers, potatoes, carrots, onions, bay leaves, celery, garlic, and thyme. Allow the slow cooker to simmer the stew to aromatic perfection. Once finished, garnish with parsley. Let the feasting commence! 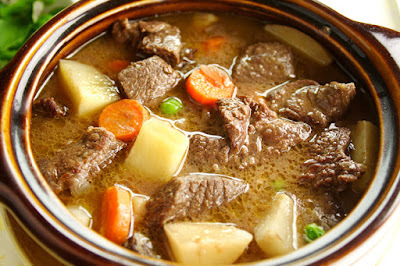 0 Response to "Slow Cooker Thick & Chunky Beef Stew"